Is it time to pivot and shake up your workout routine? This quarter’s focus is on MOVE—and, not coincidentally, #MOVEinMay is the theme for National Physical Fitness and Sports Awareness Month. At HPMI, we are big fans of HIIT (High Intensity Interval Training). Why? Because these super-short workouts get you in shape, fast! Want to move from couch potato to hiking in the foothills without being out of breath? Train for a triathlon? Climb the Dolomites? Drop some pounds or your blood pressure? 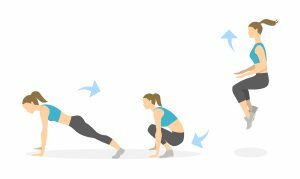 All of these can be achieved with very short, intense bursts of exercise. HIIT is effective for any age and level of fitness. Challenge yourself to incorporate HIIT exercises for the next 30 days and experience how a few minutes can be transformational. FYI – Lisa and her husband have committed to do at least 10 Burpees every day for the next 30 days! Join us in our burpee challenge or check out the HIIT resources on the right and choose your own challenge.